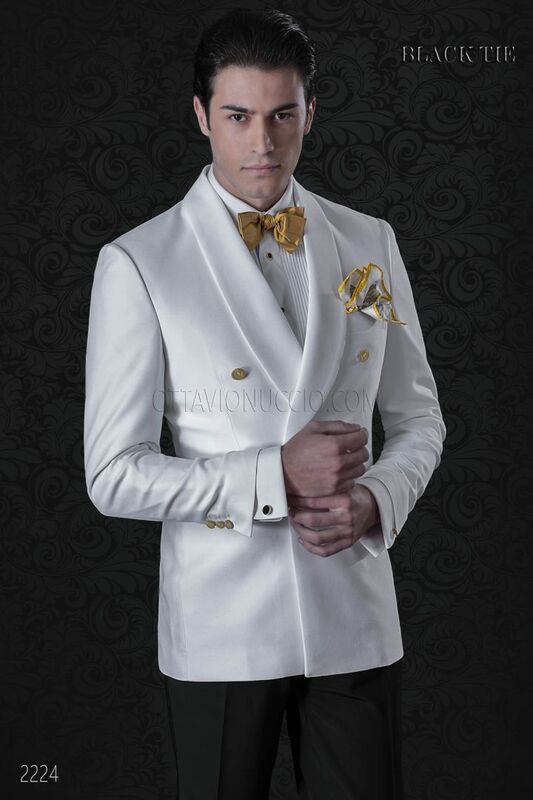 White double-breasted jacket in viscose blend with shawl collar, no vents at back, goldened buttons and contrast cuffs a... White double-breasted jacket in viscose blend with shawl collar, no vents at back, goldened buttons and contrast cuffs at sleeves. Shirt made from white cotton with classic collar and pleated detail on the front. Exposed placket with black and gold en... Shirt made from white cotton with classic collar and pleated detail on the front. Exposed placket with black and gold enamelled buttons. Double cuffs with black and gold enamelled cufflinks. Bow-Tie made from 100% gold silk.Handmade. Handkerchief made from white and yellow cachemire printed silk.